You are here: Home / Homeschooling / Zoology for Kids with Nancy Larson Science! 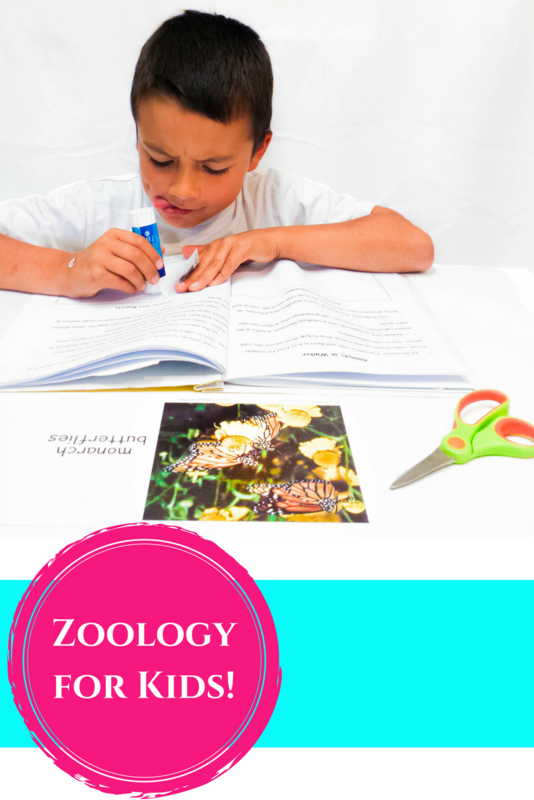 This summer we have continued working on our Nancy Larson Science for Homeschool and have been doing our unit on Zoology (the study of animals). This has been such a fun unit for the kids and I can’t wait to show you some of the fun activities we did! Before I do, take a minute to pin this image and help spread the word! If you are wondering why we love Nancy Larson Science for Homeschool so much, just take a look at everything we covered in our Grade 1 zoology unit. Land habitats and the animals that live in them. Water habitats and the animals that live in them. How animals camouflage and why. Migration and hibernation/what animals do in the winter. Sorting and organizing animals based on their habitat, whether they migrate or hibernate or are herbivores, carnivores or omnivores, etc. What are mammals (what are their characteristics)? That’s pretty incredible for grade 1! The program is so in-depth that I am using this science curriculum with my grade 1, 2, AND 3 all together! They are meeting all our provincial learning outcomes, enjoying the lessons immensely and are being exposed to a very broad range of science. 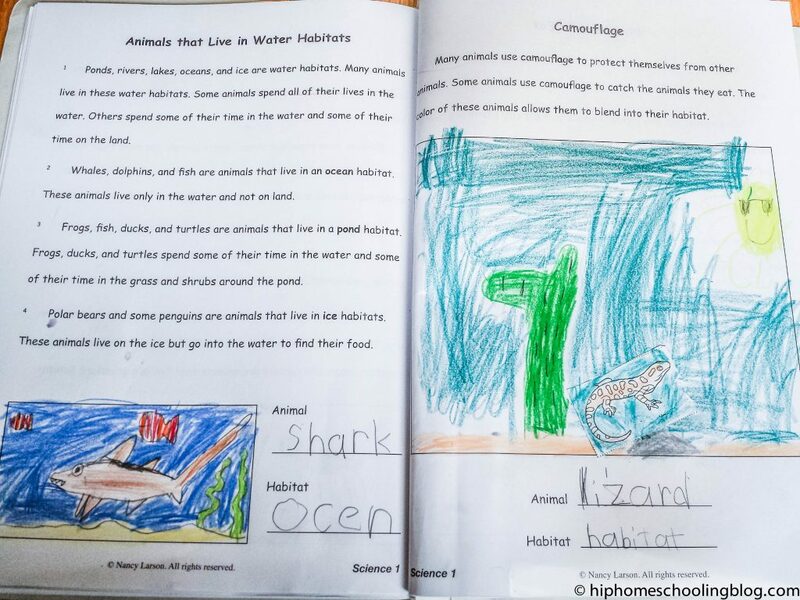 I’m not exaggerating when I say that my 5 year old cried when we finished the zoology booklet, he LOVED learning about animals! When we first received our Nancy Larson Science for homeschool grade 1 curriculum, our youngest was in kindergarten. He was not yet reading or writing and we ended up only getting 2 of the student packs for the older kids. He spends the lessons coloring a picture of what we are discussing or playing quietly with his sticker collection. And yet, at the end of the lessons he is spouting off more information than his older sister! I am so impressed with the caliber of this program! Malakai drawing a whale migrating to warmer water. How Nancy Larson Science teaches in-depth zoology to young kids in a way that is easy to understand without losing the FUN! What has most impressed me about this curriculum is that Nancy Larson Science is a program that teaches so much detail but it doesn’t forget about the fun! It isn’t dry and boring. The text is written at the students level (my grade 2 daughter’s reading improved DRAMATICALLY as she read her lessons along with me) and is easy to understand. The lesson activity sheets are not tests and quizzes as much as fun “what do you remember” worksheets. There isn’t too much writing (that would be a total fail in my kids’ books), it isn’t overwhelming, there is a lot of coloring and drawing and circling the answers. We even had a lesson where the kids had to make a riddle for me! This is one of their favorite passtimes so they couldn’t wait! They kicked me out of the schoolroom… take a peek at my 7 year old’s riddle in this short little video. Teaching Zoology with no prep! It is rare to find something that you don’t have to prep, paraphrase, explain or think about when it comes to science! The fact that I can just open up my teachers guide in the afternoon and start reading makes this program the perfect fit for our family! I literally don’t have to think! I don’t have to look at their books to read with them, their text is written in my book! I don’t have to paraphrase or simplify or explain, EVERYTHING is explained and written at my children’s level. This past week as we learned about hibernation in our zoology study, I asked the kids what animals they could think of that hibernate in the winter. Inevitably bears came up and I just moved on. BUT WAIT! The teachers guide had a note for me RIGHT THERE that bears are actually not true hibernators. It’s like they know my mind! They have taken the time to figure out what kids are going to answer developmentally and taken care of all the details! I sip a coffee and read. All the stress of teaching science has been eliminated and I am REALLY enjoying learning alongside my children! Do you use a science curriculum in your homeschool? Hi, I’ve been curious about this curriculum but I have hesitated because it is secular. Have you had any problems dealing with that aspect? How much of it would need to be adapted?